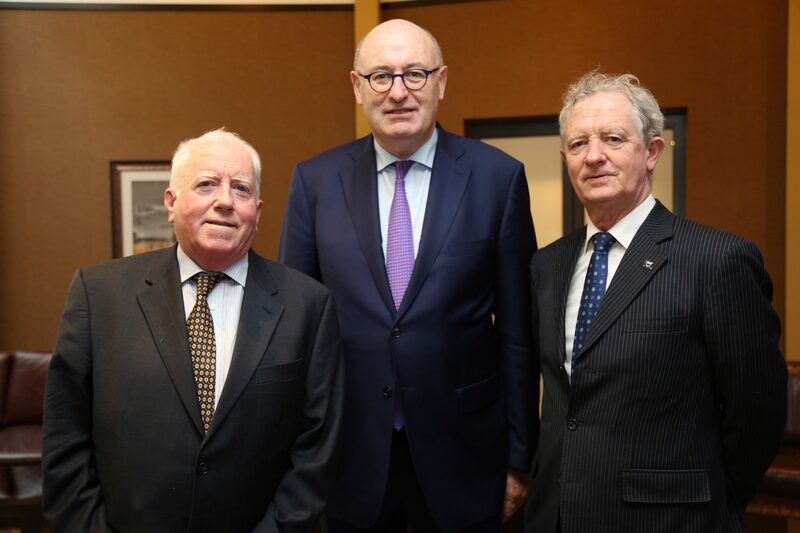 EU Commissioner Phil Hogan with AEJ Chairman Richard Moore and Gerry Kiely, Head of the EU Commission Representation, Dublin. 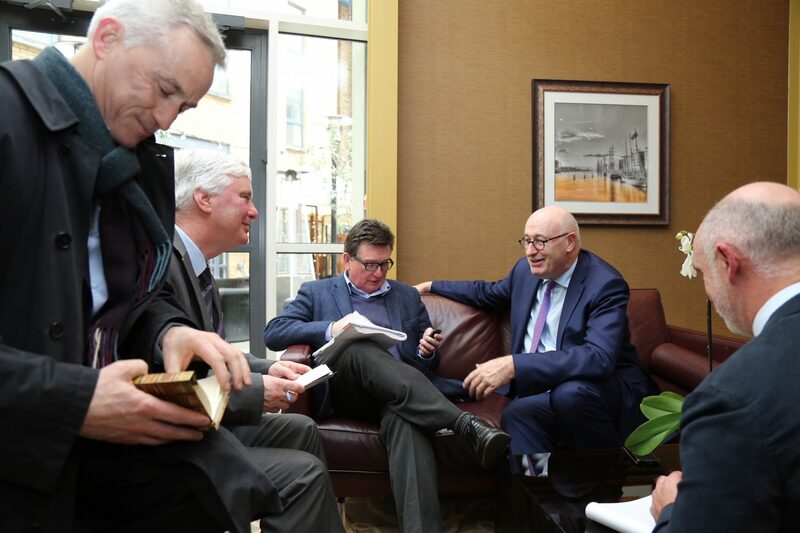 EU Commissioner Phil Hogan briefing media, including Vincent Wall, Newstalk, Stephen Collins, Irish Times and John Downing, Irish Independent. 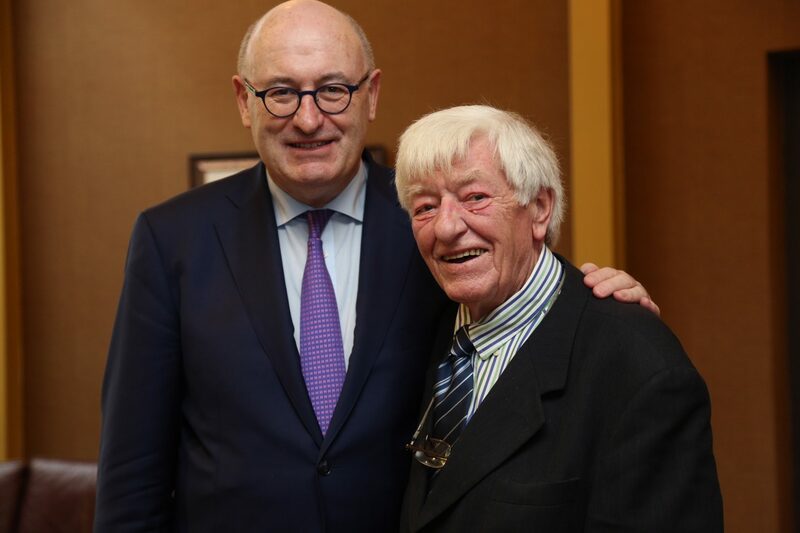 EU Commissioner Phil Hogan with AEJ lifetime member, Mike Burns. This is an interesting time in politics – whether domestically or internationally. Having left domestic politics behind me in 2014, I’m happy to leave them there, so forgive me if I don’t have anything to say on the domestic issues of the day. But, there’s plenty to be said about international issues, which are as relevant to Ireland as they are to anywhere else. As has been the case for some time, the issue on most people’s lips is Brexit and where it leaves Ireland. Brexit, which is one of the most profound events to occur to this State, will take place a little over twelve months from now. A link that goes back to Independence – since when we have both been either outside or inside the European Union – is being broken. It undoubtedly represents a challenge for Ireland, but one for which I now believe the country is preparing well. Remarkably, more than eighteen months after the referendum, we are absolutely no wiser as to what kind of post-Brexit relationship the UK wants with the EU. Indeed, not alone are we no wiser about the future relationship, but it seems that the UK doesn’t know what it wants itself. Trying to establish the UK position is like playing handball against a haystack. The message to the UK, therefore, is when you do know, maybe you’d let us know ! And, while they’re thinking about it, perhaps the government will give some more consideration to its own analysis, which suggests that, even with a comprehensive FTA with the EU, UK growth would be 5 per cent lower over the next 15 years compared to current forecasts and, in a “no deal” scenario, growth would be reduced by 8 per cent on current forecasts. Hardly surprisingly, one anonymous Whitehall official, when asked why the analysis was not being made public, said “because it’s embarrassing”. The best that an official spokesperson could say was that “more work needs to be carried out to make use of this analysis and draw out conclusions” – whatever that means, because the conclusions seem clear. The analysis also suggests that Northern Ireland (even without the possibility of a hard border) would be one of the UK regions facing the biggest falls in economic performance. Of course, none of this should be surprising even to those who believe the slogans portrayed on the sides of London buses. There are some in the Brexiteer community already boasting that the economic cataclysm forecast never materialised. Well, of course that’s because Brexit hasn’t materialised, yet. But we do know that since the Brexit vote, Britain has gone from being one of the fastest growing economies in the Group of Seven rich nations to one of the slowest, with only Japan and Italy forecast to grow more slowly in 2018. Real GDP growth rates in the EU27 have remained stable at a healthy 2 per cent since then, surpassing other large advanced economies, like the US and Japan, and they are projected to remain at similar levels in 2018 and 2019. Total investments in the EU27 are on the rise, closing in on pre-crisis levels and driving EU economic growth. The EU is committed to doing even more, with an increased investment target of €500 billion. And The EU is the largest trading bloc in the world, as well as being the top destination for foreign investment. These divergent economic outlooks present a conundrum for Ireland: how we can we mitigate the losses from Brexit while maximising the opportunities in the increasingly confident EU 27? I attended an event in the Dublin Port this morning where I urged all economic operators to make contingency plans for all possible Brexit outcomes, including the worst ones. We need to prepare for a future trading relationship with border and customs controls. Otherwise Dublin Port, and every business relying on it, will be facing tailbacks, delays, administrative logjam and increased costs. Ireland and the broader EU27 are very fortunate to have Michel Barnier “in the blue corner”. He has demonstrated a consistent and deep understanding of Ireland’s unique exposure to Brexit, particularly in relation to the GFA and trade issues, and I am confident that he will vigorously defend the red lines built into the Phase One conclusion text. Discussions on transition conditions are advancing and the EU has tabled its requirements, guided by the principle that the UK will be a third country after March next year. Ø the UK can talk with others about post-Brexit trade agreements, but only talk. It seems the UK wants to vary these conditions to avoid being a rule-taker but it can’t be a third country and be a rule-maker in the internal market. The European Union is confident that it can achieve its two objectives, the divorce and the transition. The divorce is already agreed; the Union’s proposed framework for transition is on the table and is clear. What is less clear is the future trading relationship between the UK and the EU. And it is likely to remain unclear because at this stage, it is an Anglo-British problem. The UK has to decide what it is seeking in its permanent relationship with the EU. It seems there’s a majority in the House of Commons for a close future arrangement that would probably translate into continuing with a customs union. A customs union would sweep away many of the actual and potential difficulties of the future relationship, providing safeguards, for example, that quality, consumer and environmental standards would be maintained. It would be good for businesses, good for jobs, good for Ireland, but would impose discipline on the UK government. The Conservative party is deeply divided between Brextremists, who want to crash out of the Union without a long-term agreement or, even, some of them, a transition period; and BINOs (Brexit in Name Only), who want to diverge modestly and slowly. This seems a bitter schism, with no signs of resolution, let alone a consensus. The unfortunate reality is that every time an encouraging noise is made in relation to staying in the customs union, the poor unfortunate who stuck their head above the parapet is savaged by the Eurosceptic wolfpack. Prime Minister May is seeking a “bespoke agreement” as a way to bridge the divide – a package of things that add up to a special arrangement. But the core of the package must be the trade relationship. A customs union might gain approval in the House of Commons but not in the Conservative Party. This reality forces Prime Minister May to go cherry-picking to find a proposal that will appease the Brextremists and be acceptable to the BINOs. The Union warns repeatedly that cherry-picking is not the way to a future UK-EU trade agreement. But Prime Minister May, ignores the advice, and sets a Brextremist-BINO agreement as her first priority. Her dilemma can be summed up by the question: are there any cherries that would appease the Brextremists and that the European Union would accept to give to the UK ? Probably not. And March – the deadline imposed by the Union to receive Britain’s proposals – is only eight weeks away. The Union’s attitude is hardening. It has acted with self-discipline; it has tried to bring order to the separation process by establishing distinct stages; suggested a calendar that would keep the stages apart. But the UK delays; brings its Anglo-British difficulties to the negotiations; seeks unrealistic outcomes that confuse EU membership with third country status; propagandises that whatever goes wrong is part of the EU’s tactics. Mutual confidence is strained. When the UK wants to pass the buck by saying the Union should come forward with a proposal for a future trade relationship, the Union turns a deaf ear. To do otherwise would be to enter the snakepit of Britain’s domestic politics. The best Ireland can do is to expect the worst and prepare accordingly. Meanwhile, the EU is forging ahead, and the Taoiseach’s recent speech to the European Parliament was very well-received and confirmed Ireland’s position at the heart of the EU. The Commission kick-started a debate about ‘The Future of Europe’ eleven months ago today, with the publication of a White Paper, which included a number of scenarios which offer a series of glimpses into the potential state of the Union by 2025. As part of this exercise, I warmly welcome Ireland’s national debate on the Future of Europe, which the government has launched and which will continue until Europe Day on 9 May. Ireland’s citizens’ dialogue is an important step and, as members of the Association of European Journalists, you have the possibility and, dare I say it, the responsibility to promote this debate and to encourage the maximum amount of citizen participation. I hope you can assist in this valuable endeavour. Just like the European Union, your noble profession also faces enormous challenges, as was highlighted in the recent presentation to this association by the chair of the Press Council, Seán Donlon, when he highlighted that more than 50 per cent of Irish people now received their news via social media, a sector not subject to any regulation. I’m sure that Fake News is probably nothing new, even if it was called something else before. In the Trump era, we have become increasingly aware of it as a concept. As with many other issues, the European Commission is showing some leadership in this area and has set up a High-Level Expert Group to contribute to the development of an EU-level strategy on how to tackle the spreading of fake news and disinformation. It comprises 39 expert representatives of civil society, social media platforms, news media organisations, journalists and academia. As you know, two of the experts chosen are Irish – Noel Curran and Stephen Rae. The Group will gather opinions on what actions could be taken at EU level to give citizens effective tools to identify reliable and verified information and adapt to the challenges of the digital age. Their work will result in an analysis of the situation, the examination of the roles of each online player, the analysis of the measures already taken and the formulation of advice. I hope that one outcome of this will be to restore some of the damage done to the reputation of the journalistic profession in recent years.